The Problem: I meet people all the time who get bucked off, pulled around, stomped on or ignored by their horse. When you force a horse into the “correct” position, you lose something important. You lose the horses engagement. He trots around with his ears back wishing he were anywhere else. So when you want to generate power, energy and strength, like in jumping or dressage, he checks out and who can blame him? When the horse does not think you can keep him safe, he starts to spook at silly things: that jump he’s gone by a million times or the wind blowing or rain falling and then we can get mad at the horse for this, proving his theory about people is true. The Basics: We will cover rules of engagement (in the herd). We will cover breath and energy. Saying hello. How to be a gentle leader. How to look out for him. How to show him when it’s safe to eat and drink (i.e. : is there a cougar around the corner he can’t see but you can?) How to push slowly from behind. 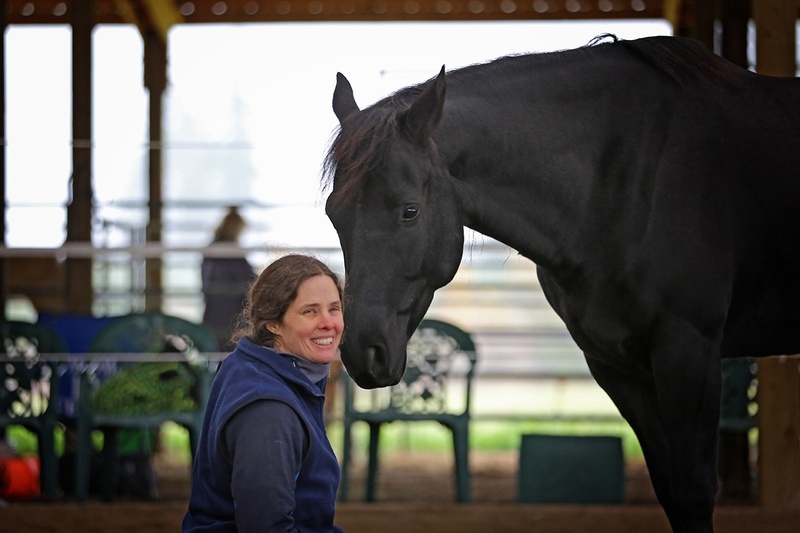 Resource management: If I set a dish of molasses-laden grain down, at liberty I should be able to call my horse away from it as if to say, “Now is not a safe time to eat.” Since he trusts that I will be fair, he knows that when it is safe, I will let him eat it. He does not get access to his food by pinning his ears and pushing overtop of me. He needs to ask for permission before he eats. Permission checks are absolutely essential to the relationship and consistency is very critical. Other topics covered in techniques: Clicker training, Targeting, Trick training.